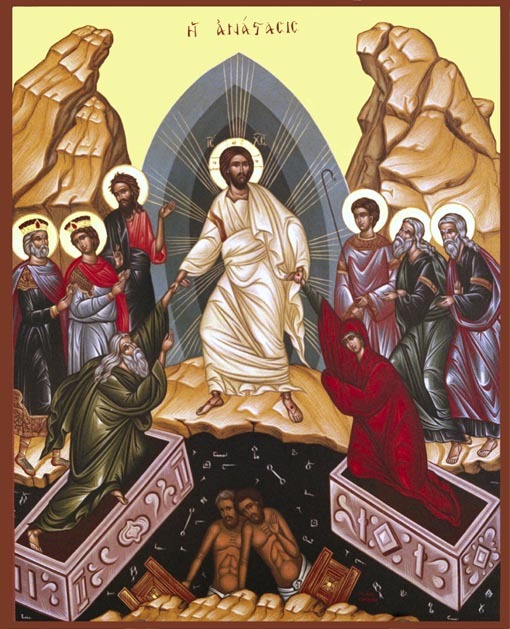 One of the questions that exercised the rabbis in the discussion of the general resurrection of the dead, even before the Christian era, was the question of continuity. The school of Shammai, working from Ezekiel, believed that God must clothe the dead bones (hence the need for careful burial, and even careful execution of criminals). The school of Hillel, working from Job, believed God would work inwards, filling the skin with new life. The difference is more subtle than you’d think, because the latter view implied a more-than-physical continuity of the resurrected with the living, since it is obvious that the skin, unlike the bones, seldom long survives death. Such issues of continuity have significance, believe it or not, for more mundane biology too. You’ll no doubt remember the fable about the old farmer who still wore his grandfather’s boots, which were so tough they’d only needed new soles five times and new uppers three times in a century. Is there any sense in which they are the same boots? A similar, and real, conundrum occurs with Nelson’s historic ship HMS Victory down in Portsmouth, which with each restoration becomes less original. My father bought this clarinet new in 1936. It was in a pretty bad state of repair when I restored it in 2007, so that I had to dissolve out the old rod-screws and cut and thread new ones, and also completely re-spring, re-cork and re-pad it. Doing the last job revealed nostalgically the old blue sealing wax I remember him using for a running repair back in around 1959. Sadly that had to go. It remains “the old clarinet” only because enough of the main material structure remains to regard the new stuff as mere “repair”. And that’s the way it is with all artificial artifacts, as well as with non-living natural objects. Continuity of identity remains only because the same matter, in more or less the same configuration, continues to occupy a discrete space. An exact copy of a neolithic axe is no longer neolithic. If Mount Everest were cast into the sea, and the Himalayas threw up another mountain in its place, it would not be Mount Everest but some new peak. The situation is entirely different for living beings. Although the common idea that every molecule of our bodies is replaced every decade or so is probably only partly true, most cells do have a continuous throughput of most of their constituents, and most cells have a finite lifespan and are replaced regularly. Even the genome changes over time, we now know, and from cell to cell. What is more, there is still an identifiable conscious “me” that persists “through all the changing scenes of life”. When my father, shortly before his death at the age of 85, remembered older kids shouting over the garden gate that the Great War had ended, when he was three, the toddler and the unrecognisably different old man were, in fact, identical. Such identity is especially related to the wonder of human consciousness. The same thing is, nevertheless, true of the faithful old dog who learned to love its master as a puppy, and even of the oak tree whose life began identifiably in a specific acorn, and which fell in death seven centuries later. HMS Victory is a third of that age, and yet its identity is far less solid. Living continuity, then, cannot be attributed to matter, and I’ve already pointed out that it can’t all be attributed to DNA, though that is part of identity. The rest is mysteriously present in probably many other factors throughout both each cell and the organism as a whole, in what has historically been called “form”. I hope I’ve shown that, without some clear idea of the reality of formal causation, we’re always in danger of confusing the static continuity of the artifact with the dynamic continuity of the living being. They are clearly very different things. And that’s before we consider the similarly intangible and immaterial (but real) ideas of kinship, colonies, societies and species, each of which have their own formal causes. When Aristotle was deliberately jettisoned at the beginning of early-modern science, form was first considered superfluous in scientific explanations and then (like final causes) non-existent. What was actually lost in this was the indispensible common feature of all non-material continuity – and that is information. We can see that’s true even in the non-living world. To return to boots and ships, there is a genuine continuity in both examples, but only in the immaterial information associated with the material artifacts involved. The farmer’s boots were, perhaps, lovingly repaired in the original style and materials. Certainly HMS Victory’s restoration is a matter of much research and decision making. Even more, though, their human story is what makes Victory worth visiting, the boots worth repairing, and the clarinet worth the labour of stripping and rebuilding. The materials are as flexible as the human imagination, which will perhaps still feel the same sense of history in centuries to come, when Nelson’s flagship has all been replaced, that the farmer does with his heirloom boots. There is absolutely no material connection between a nineteenth century phonograph cylinder and a YouTube clip of the same recording – and yet we have no difficulty in recognising them as the “same recording”. A great novel is not a manuscript, but a reading experience. Transhumanists think they have some handle on all this when they propose downloading human software to a computer, in the hope of some technological “resurrection” in due time (or maybe it’s just the ability to print oneself out). Their vision is fundamentally flawed because they still have no real concept of human form, mistaking brain-states for all the information that God and living experience puts into a human being, but they do at least realise, dimly, that the only continuity that materialism supplies is a truncated view of the world and of people. The Bible doesn’t, in fact, teach that man is intrinsically immortal. But it does teach that in death, we are held somehow in the safety of God (who is immaterial) until such time as, like Christ, we are raised to whatever may be our just reward – and for the redeemed, at least, there is both a fundamental continuity with those long-buried physico-psychic entities we were in this age, and a discontinuity in both our perfection and the superceding of mortality with spirit. I fancy that has more in common with the acorn that becomes and oak than with the fighting ship that becomes a museum.